A well organised and comfortable day. We walked to the pick up point and the bus left at 7.30am and we had a breakfast stop at about 9.00am. Next was a tour of Naples with a stop for photos overlooking the bay. Lunch was really good and the venue was great as there was just our coach being served in a light and airy room and was a good opportunity to talk to other travellers. We had a 2 hour tour of Pompeii with Vittorio our guide. It doesn't sound a long time but Vittorio showed us the most interesting parts of the ruins with a great sense of humour and knowledge. We then had half an hour to ourselves. The group met again at 4.30pm and after a bus journey of approximately one and a half hours we had a quick stop arriving back in the centre of Rome at around 8.00pm. It was a long day but well worth it as you get to see some beautiful Italian countryside and the imposing sight of Mount Vesuvius. The best part of this tour was the very interesting and hilarious Marco, the commentator on the bus, and the banter between him and the driver, Franco, and the Naples guide, Connie. They made the trip fun. Very well-planned bus trip from Rome comfortable with the appropriate amount of stops along the way for bathroom snack and bathroom breaks. Great lunch at Naples, beautiful! The only thing that would have improved the day was the weather, as there was, unfortunately, a lot of Sahara desert sand in the air, mixed with moisture, making it less than perfect for viewing and photography, but oh, well, you cannot control the weather! This trip is totally worth it! 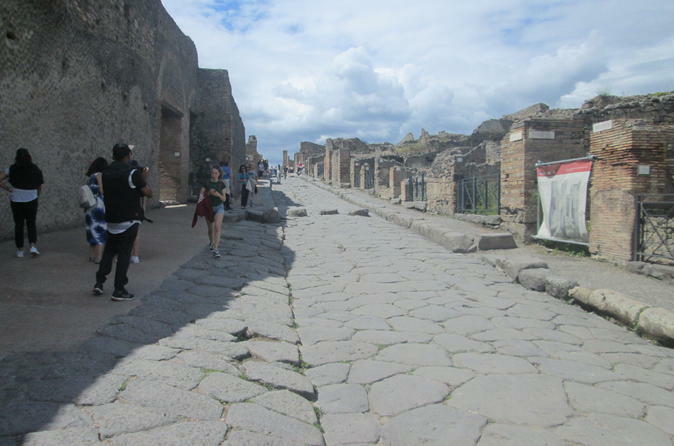 Pompeii is amazing to see! Overall a good tour, however the bus was very hot and stuffy. Even after we asked for some air circulation it didn't get any better. Our guide was difficult to understand. We almost stopped listening to him through the ear pieces because it was too frustrating trying to understand what he was saying. Good tour with lots to look forward to. Lunch is nice and comfortable after being on the bus/touring. The little stops in Naples are nice for people who haven't been before, but you won't really be getting out and doing anything beside a few photos ops so be prepared for that. All around a good tour and guide around Pompeii. Hotel pickup worked well. Lovely panoramic view of Naples with good lunch included. 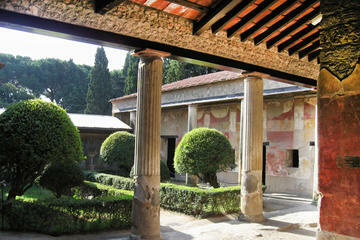 Then short drive to Pompeii site. Excellent guide who brought the city alive then bus back to hotel. Great day out. Missed this one had a family emergency but hope to go someday soon. Looking forward to it so I'll give it a 5. Local tour guide, Roberta was nice and knowledgeable. I and other people in my group had huge problem with understanding her English.